While visiting Taipei, Taiwan, I went to the Jade Market with a local guide. The market is located across from a flower market and below an overpass, which keeps it protected from changes in the weather. Within the market there is booth after booth and row after row of treasures for anyone with a sense of adventure (or an adventurous bargain hunter). 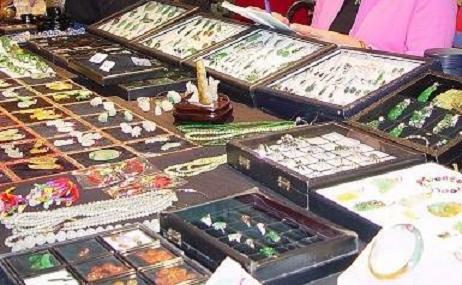 Some vendors have their items stacked neatly in rows, and others have piles of jewelry ready to be pawed through. Take your pick!